Technology changes rapidly when you're not paying attention to it. It actually changes pretty darned fast even when you are. I've not been blogging for a while and the online photo editing program I used to use apparently decided to cease operations at some point in the last year or so. Since I only use it for watermarking blog photos, I never noticed that it wasn't there anymore... not until I needed it. So, better late than never, I give you all my very happiest of Mother's Day wishes. If you're not a mother, I'm betting that you had one, so have a big bucket of happy wishes from me anyway. And speaking of lateness... while I did finish the cards I made for our moms in plenty of time, I did not get them to the post office in time for Saturday's delivery... this blog post was to be a preview. Oops. It's a good thing I already have a reputation for doing this type of thing... expectations are never too high and nobody gets disappointed! Just being true to myself (har har). I make 99.9% of the greeting cards we send out which saves us a lot of money and takes me hours and hours to do. Somehow this makes perfectly logical sense to me. It also means I must love you a lot. Seriously, I'm not going to spend that kind of time on you if I don't care for you. Consider it an expression of my love. Because it is. Very much so. 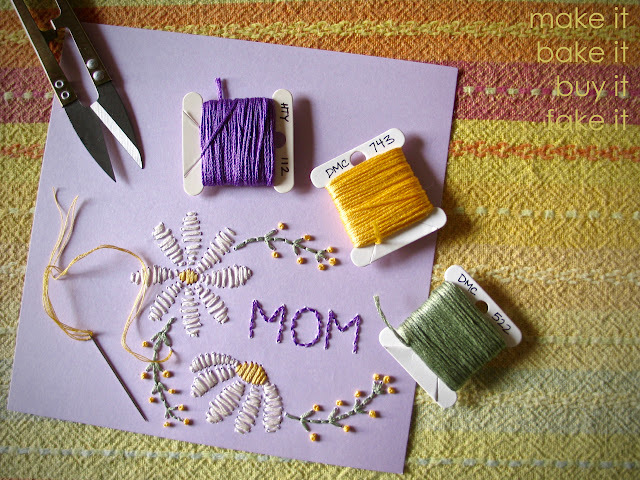 I dragged out the old embroidery basket for the Mother's Day cards I made this year. Links for the design, template and instructions for this lovely card can be found on the wonderful but sadly now also defunct blog How About Orange. I really love how these cards turned out and enjoyed making them so much. I stitched the design onto a separate piece of cardstock (see photo), trimmed it down and then attached it with strong double-sided adhesive to a colored blank card. Simple, easy, and yes, more than a little time consuming. Don't use a thin cardstock for the stitching. Don't use too long of a length of floss. Yes, it's a drag to stop and start often, but constant twisting and unwanted knots are a bigger drag and take longer to deal with. When your floss starts to twist on itself, stop and hold the work up letting the needle and thread hang freely. Pick the needle back up and continue stitching. Do use tape to stick the ends of the floss down when starting and stopping (instead of knots). It won't be seen and you won't have any extra bumpy bulk to deal with. Don't make more work for yourself by making smaller stitches than the template shows... it's a simple project but takes longer than you think it will! Take your time pulling each stitch through. Rush it and you risk knotting your floss or worse, tearing the paper. If your holes are too close together and/or your floss has too many strands, you risk tearing through between the holes (think of perforated stamps). Use the thinnest embroidery needle that you can get your floss to thread through. Don't skip the pre-punching your design step! It's crucial to success. * I don't know if "stranding" (to strand) is the correct term, but you'll want to do it anyway. It makes your stitches behave better during and look better after. To do it, cut the floss to a workable length (no more than 20") and pull each strand out separately before recombining the number you want to use (I used three for the card in the photo above). Just grab one thread and pull straight up (not outward), lay it down flat and pull out each of the remaining threads one-by-one. Here's another yummie I made a while back but never posted. It just looks like Easter doesn't it? It looks like spring. But I didn't bake it in spring or for Easter. Actually, I think I might have. But I never got it onto the blog though, did I? Now, a chocolate cake is fine any time of the year. Seriously, it just is. But once I sprinkled those candied sunflower seeds on top (to distract from my weird icing technique), it just plants itself firmly at Easter or the weeks surrounding it. There was of course a frosting fail on this one. It's always something, and this time it was the frosting. * There's a whole back-story about how I contacted Joy (The Baker, herself) regarding the frosting issue I was having and how very very gracious she was with her replies. It was so long ago now, that the details aren't important. What matters is how delicious this cake is (frosted or not), and how lovely she was about taking the time to listen and respond to my questions. She is the real deal, and her recipes rock. My Notes: As I mentioned above, I had issues with the glaze and ended up whipping it in the mixer which turned it into the fluffy gargantuan mass of frosting you see in the photo. I have never frosted a bundt cake in my life, and hadn't a clue what to do with it all. I had no choice but to just wing it since I was taking it to an event. Weird but delicious. *Actually a lot of the time it's the frosting that gives me the most problems. Apparently it's a "thing" with me. Which then obviously is why I don't do a lot of frosted cakes! The fact that this scrumptious cake is supposed to be GLAZED and not frosted should tell you something. Welcome to my virtual life... Poke around in here, spend some time and enjoy! All content on this blog originates from me, unless otherwise noted. Feel free to link to my blog and/or specific posts (with proper credit, of course). Your mistakes might as well be your own, instead of someone else's."